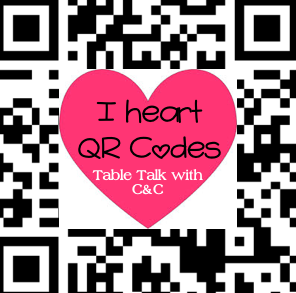 Table Talk with C and C: QR Code Linky Party! to see how I used QR codes in my class! Very Cool idea. I linked up. How fun! I just linked up with my first QR Code project. Hoping to finish a few more this week! I'm a new follower. Hi Theresa! So glad you linked up with us! Can't wait to check out your project and to see what you are working on! Heading over to check out your blog now!! I love using QR codes. I found you from Pinkadots blog. I'm a new follower. I'll be linking up soon! Thanks Bethany! Can't wait to check out what you posted! Thanks for hosting this linky! I just tried QR codes for the first time tonight and I want to make more for tomorrow. Lol maybe I can find something here. I am your newest follower! So happy you joined our linky party! Love your activity! Can't wait to see what else you create!! It's addicting! We are in the organizing a technology blog hop and would LOVE to have you join us! If you are interested here is the Google Form to sign up! We would love to join!! We will check out the form and sign up. Thanks so much for asking!! Love all the technology you've incorporated! Nice! Thanks for inviting me to your party! I'm your newest follower! So glad you joined our Linky Party Joanne! We also linked up with your Spark Student Motivation Saturdays Linky Party. Love that idea for a linky party! I just linked up and added your QR button (soo cute!) to my post! I love QR codes and have been using them in my classroom. I am excited to see how others are using them too. Thanks so much for hosting this great linky party! Thanks for linking up Stephanie! So excited to see how you are using QR Codes with your class also!! A great link up! Thanks. I posted on my blog as well. So glad you linked up with us! Thanks!